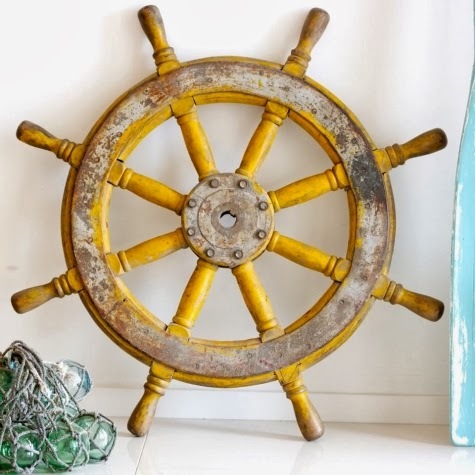 11 ship wheel wall decor ideas that show a stylish spin on the old captain's wheel. You can find a great selection of Ship Wheels for the Wall at Wayfair, including Ship Wheel Mirrors, as seen in a bathroom featured here. And if you are looking for an authentic ship wheel, try Ebay. 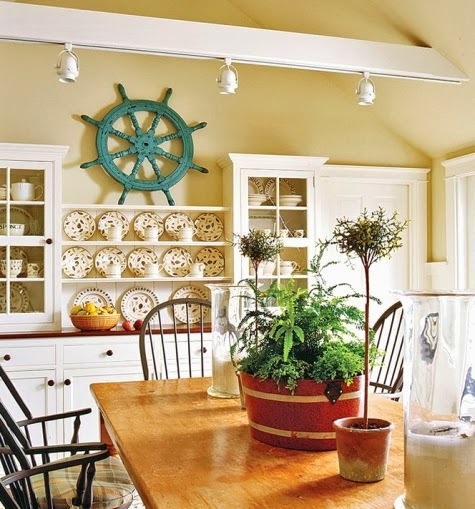 This ship wheel adds a nautical accent as well as a splash of color to the space. Via Coastal Vintage on Facebook. 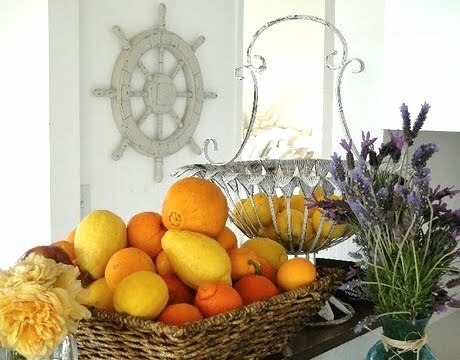 A dining room enlivened by a turquoise ship's wheel. Via Traditional Home. To check out another turquoise painted ship wheel, click here! A white painted ship wheel wall decor idea for the bedroom. A thrift store find was given a Paint Makeover to blend in nicely with the overall color scheme. Featured here. A subtle and sophisticated ship wheel look, adding some dimension to the wall. 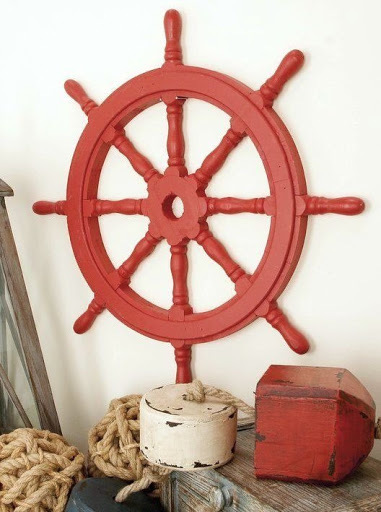 Another ship wheel wall decor idea that is on the more subtle side. Take a tour of this California Cottage. An authentic ship wheel is displayed on the wall along with nautical charts. See here. 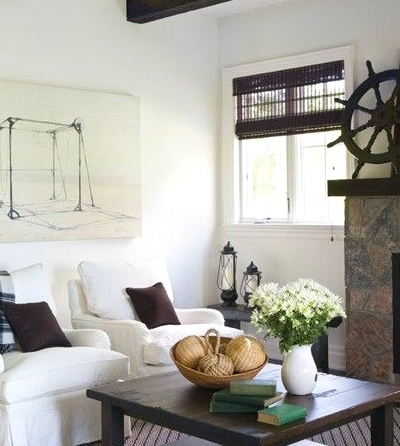 A ship wheel with character can easily be the main focal point of a living room and be right up there as wall decor above the fireplace mantel. Featured here. Gorgeous black ship wheel via Eldorado Stone. 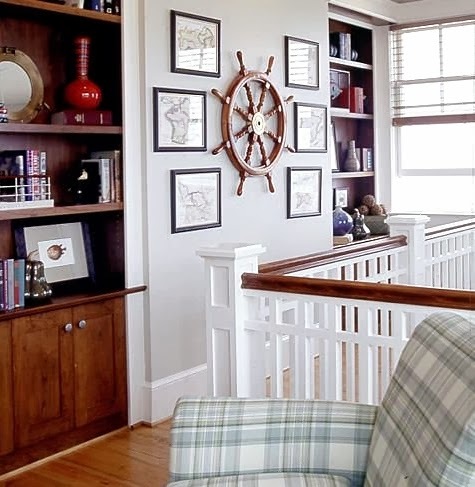 Barclay Butera uses a pair of ship wheels as wall decor above the sofa. 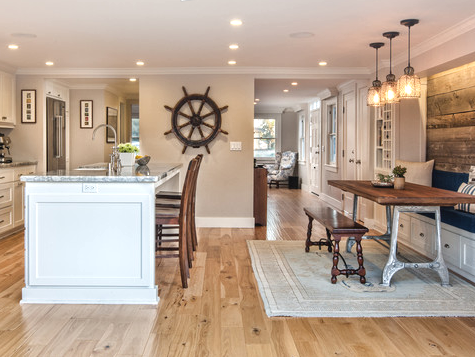 An eye-catching ship wheel wall decor idea from a kitchen by Christian Rice Architects, via Houzz. 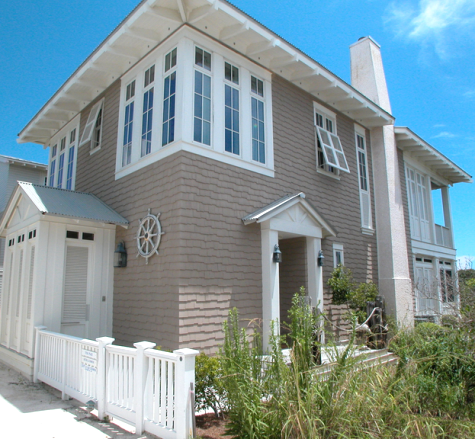 And a Seaside Florida home sports a ship wheel decor idea on an exterior wall, featured here.